If you've made your first garden visit of the 2018 season, you may have wondered what was new. Though subtle, you noticed something was different. The truth is that a lot of work happened in the garden while it was closed for maintenance, even though it's hard to tell. 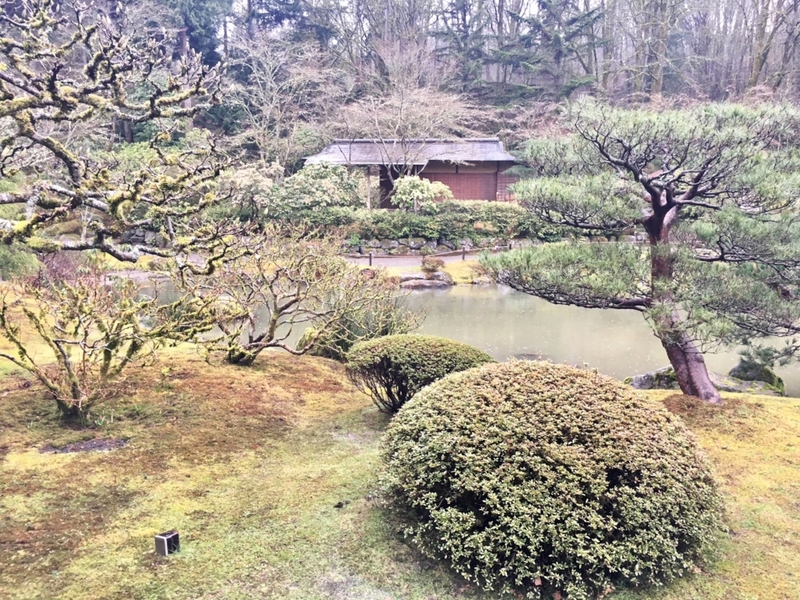 "In a Japanese garden, when a job is done well, it looks like it's always been that way," says Senior Gardener Pete Putnicki, as he points out a section on the east shoreline of the pond where several azaleas were transplanted in from other areas of the garden. The new elements here were so carefully placed, they appear as though they were brought in years ago, not just a few weeks back. 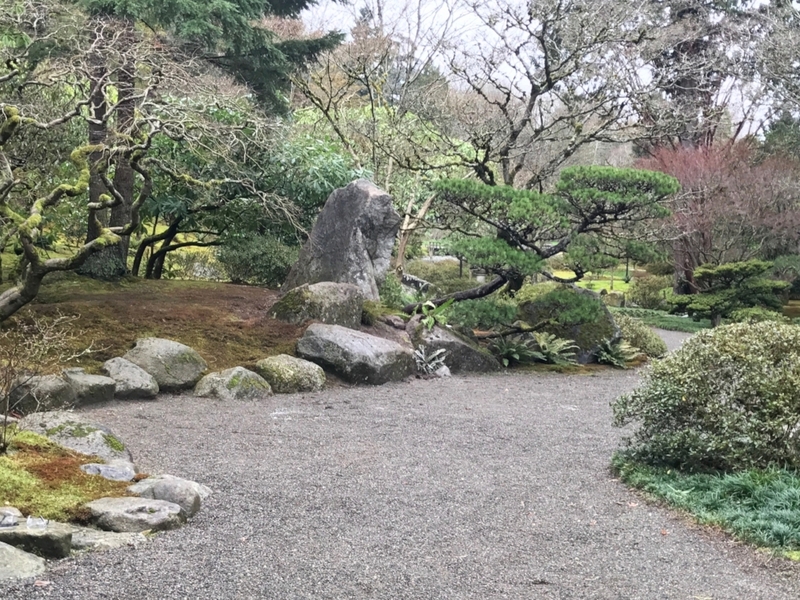 Because it's so easy to miss the careful effort the gardeners put into maintaining and improving the landscape, we've put together a slideshow of the wintertime projects, including some fascinating work-in-progress scenes. Winter weather can be harsh on the gardeners who still work outdoors daily during the maintenance closure. The stone groupings are being prepared to move. Not one piece of heavy equipment was used to complete this task. The gardeners carefully assess the direction the stone will be pulled. Burlap protected the trees in the vicinity from potential damage. Wood posts and cement blocks provided stability as the stones were rearranged. Senior Gardener Pete Putnicki (left) works with the landscape crew to keep the large stone from the danger of falling over. The stone groupings are now situated at a more natural, upright angle. A closer look at the stones offer a sense of scale. The Yukimi-doro lantern under the maple in the dry stream was re-set. 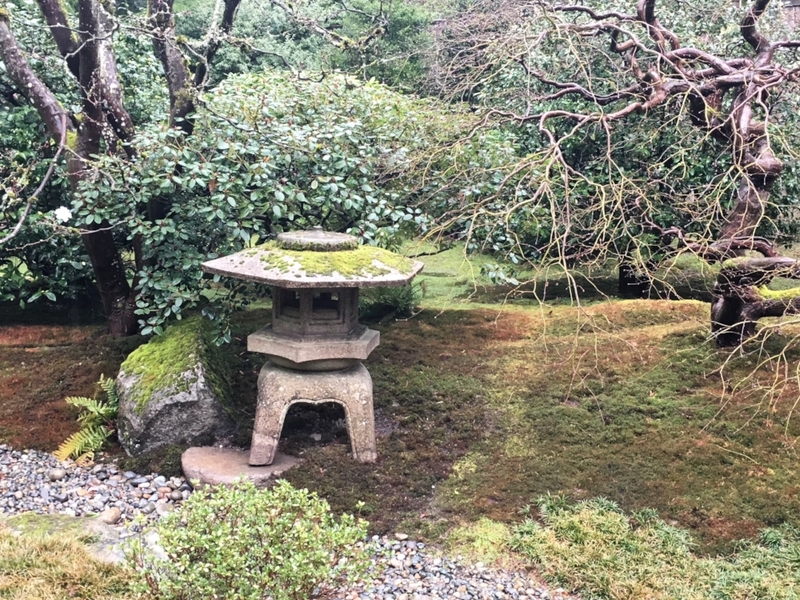 The gardeners dissembled the lantern, moving each section to the middle of the path (each section weighed several hundred pounds). The ideal position for this type of lantern is with one foot extending out into the water, so the positioning was adjusted to create that appearance. The site cleared to make way for the new bamboo fence. Materials were generously donated by Mark Meenan of American Bamboo. 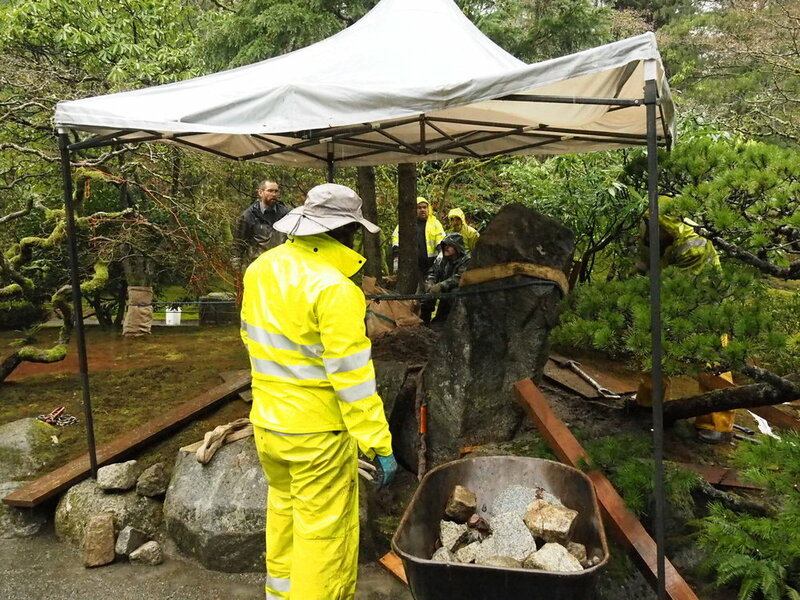 Seattle Japanese Garden's own volunteer group, Unit 86, also contributed funds to this project. Near completion. Each section was laboriously hand-tied in place. The finished Teppo-gaki, viewed from the path to the west of the Tateuchi Community Room. 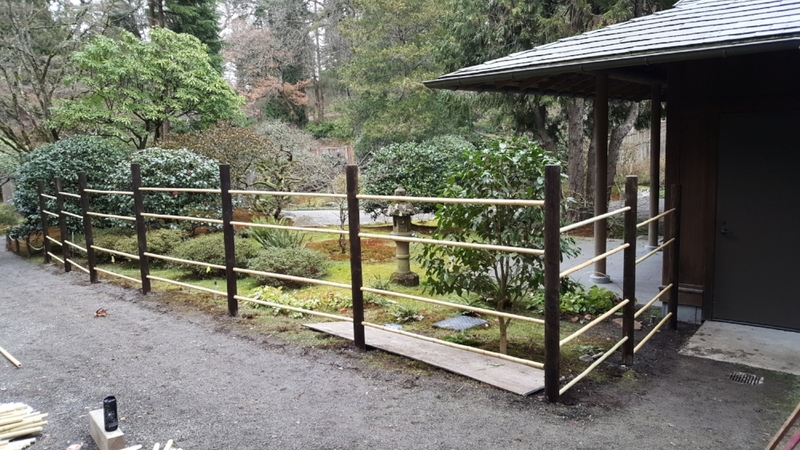 "By using a tall, fairly dense fence," says Pete Putnicki, Senior Gardener, "we are able to create the illusion of more depth through separation and add to the appearance of a Tsubo-niwa enclosed Garden in that area." Three shore pines at the northwest corner of the pond were removed and transplanted to the parking lot to replace a big-leaf maple that failed in November. of last year. The soil was removed and a drainage system was installed to help reduce the water-logged conditions in that area that have been contributing to the decline of those trees. 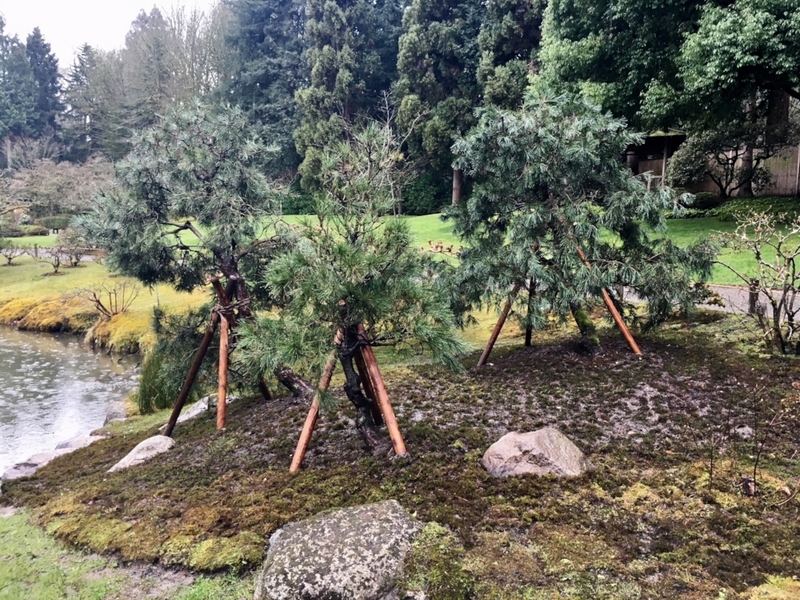 Three new trees (Japanese red pine or hybrid) were installed, two sourced from other areas of the Garden and one donated by Lonnie Carver, retiring Seattle Parks and Recreation Senior Gardener who worked at this garden for several years. Moss was gathered and installed as a ground cover. "We are looking forward to seeing how these trees respond to their new home," says Putnicki. Numerous azaleas were moved in the Garden, both as structural elements and to help refine the spring color display. These two azaleas were previously located near the wisteria arbor. Here the cape area, an azalea was removed and was replaced with a large, rounded boulder to create create a greater sense of structure along the shoreline. One set of images shows a grouping of very large stones near the entry gate house being moved. Over the course of many years, the large, upright stone had come to lean at an awkward, unnatural angle and needed correcting. You'll notice that the crew is relying on by ropes, pulleys, hand tools, mechanical chain ratchets and human power alone for this job, as site limitations prohibited use of any heavy equipment. 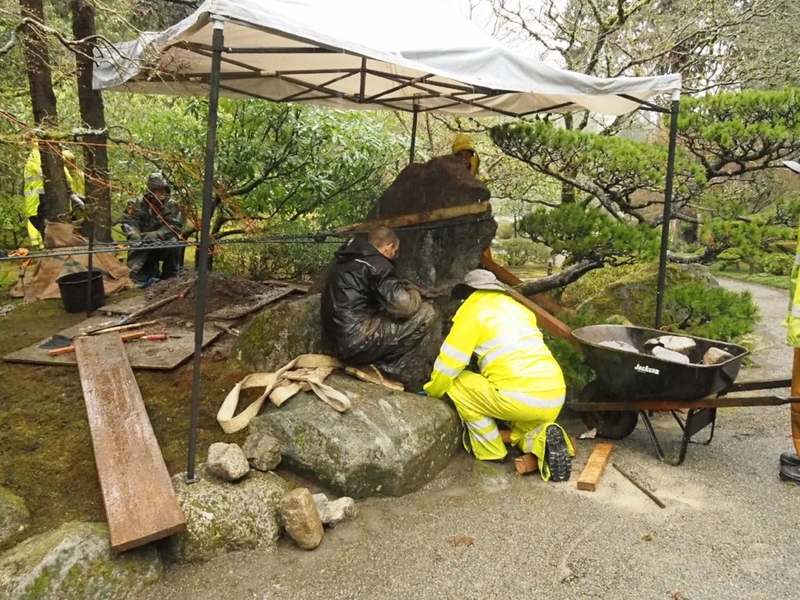 At times, as many as nine people worked in unison to keep the stone safely upright as they changed its position, utilizing wooden posts and cement blocks for stability. Given the amount of strength and stability needed to get this project done safely, it was fortuitous that newest crew member just happened to be a former University of Washington Husky line backer! The garden also has a new, Teppo-gaki style bamboo fence near the courtyard garden just outside the Tateuchi Community Room. 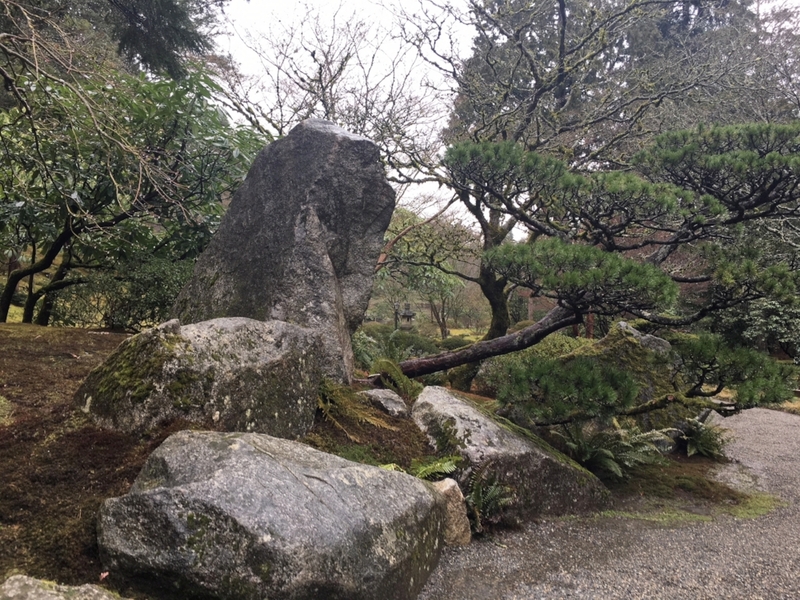 "By using a tall, fairly dense fence," explains Pete, "we are able to create the illusion of more depth through separation and add to the appearance of a Tsubo-niwa enclosed garden in that area." 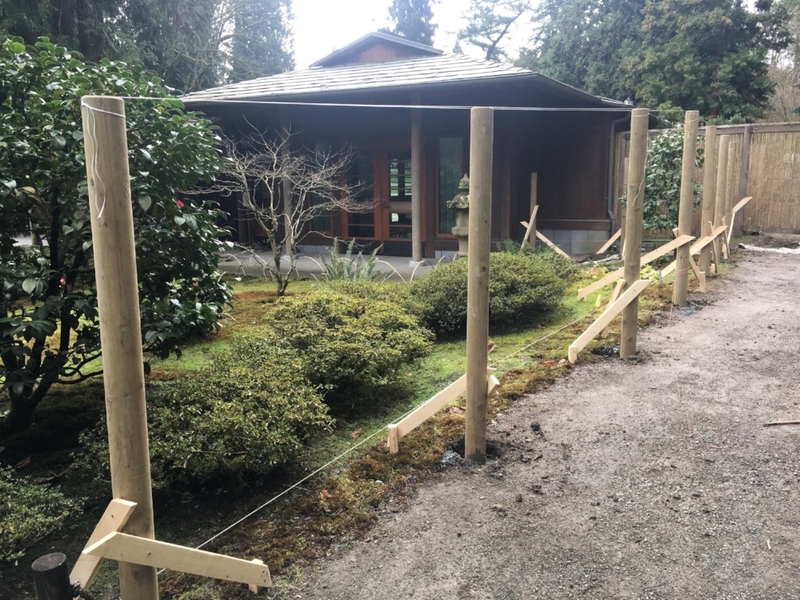 The project began just as the temperatures dropped in February, causing the gardeners to begin the process of tying the bamboo sections together as snow fell on them. Nevertheless, the gardeners consider this to be one of the most rewarding projects they undertook this past winter. Next time you visit, see if you can identify these changes to the garden, if not with the eye, with the degree of beauty you sense as you stroll through. And when you do, take a moment to consider all the skilled effort that goes into creating a calm, refined garden that appears as though it's always been that way.